Sabine Himmelsbach – since March 2012 she is the new artistic director of the House of Electronic Arts Basel. She studied art history at the Ludwig Maximilians University in Munich. From 1993–1996 she worked for galleries in Munich and Vienna and later became project manager for exhibitions and conferences for the Sterischer Herbst Festvial in Graz, Austria. In 1999 she became exhibition director at the ZKM | Center for Art and Media Karlsruhe. 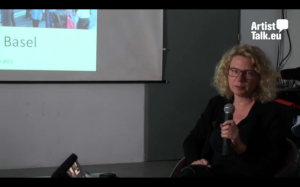 From 2005–2011 she was the artistic director of the Edith-Russ-Site for Media Art in Oldenburg, Germany. Her exhibition projects include „Fast Forward“ (2003), „Coolhunters“ (2004), „Playback_Simulated Realities“ (2006), „Ecomedia: Ecological Strategies in Today’s Art“ (2007), „Landscape 2.0“ (2009), „MyWar. Participation in an Age of Conflict“ (2010) und „Culture(s) of Copy“ (2011). 2011 she curated the exhibition “gateways. Art and Networked Culture” for the Kumu Art Museum in Tallinn as part of the European Capital of Culture Tallinn 2011 program. As a writer and lecturer she is dedicated to topics related to media art and contemporary culture.